Visitors learn about the COBRE programs at UAMS and ACRI during a Showcase of Medical Discoveries event. Sept. 27, 2018 | Sept. 27, 2018 | Have the COBRE programs at UAMS and ACRI reached critical mass and can now benefit the entire campus research community? Mark Smeltzer, Ph.D., certainly thinks so. There are now six active Centers of Biomedical Research Excellence (COBRE) grants from the National Institutes of Health (NIH) at UAMS and the Arkansas Children’s Research Institute (ACRI). That translates to about $11.5 million a year in research funding. Each COBRE is built around a theme. Junior investigators working on the theme benefit from funding, mentoring, technical support, technology and an environment that encourages collaboration. Participants are more likely to obtain independent federal funding, “graduating” from the COBRE and opening a spot for the next junior researcher to benefit. Over time, an institution develops clusters of expert faculty supported by the necessary technology to be leaders in their field. There are six COBRE programs at UAMS and ACRI. 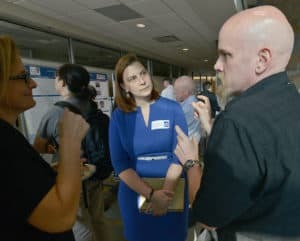 But Smeltzer — who is director of one of the more longstanding COBRE programs at UAMS, the Center for Microbial Pathogenesis and Host Inflammatory Responses — thinks the centers can do even more. The Showcase of Medical Discoveries event was held at the Winthrop P. Rockefeller Cancer Institute and attracted one of the largest crowds to date. 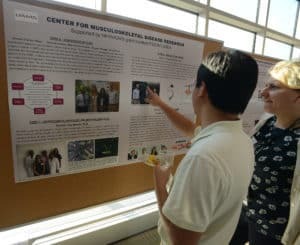 As a step in that direction, the COBREs took center stage at the Showcase of Medical Discoveries in September. 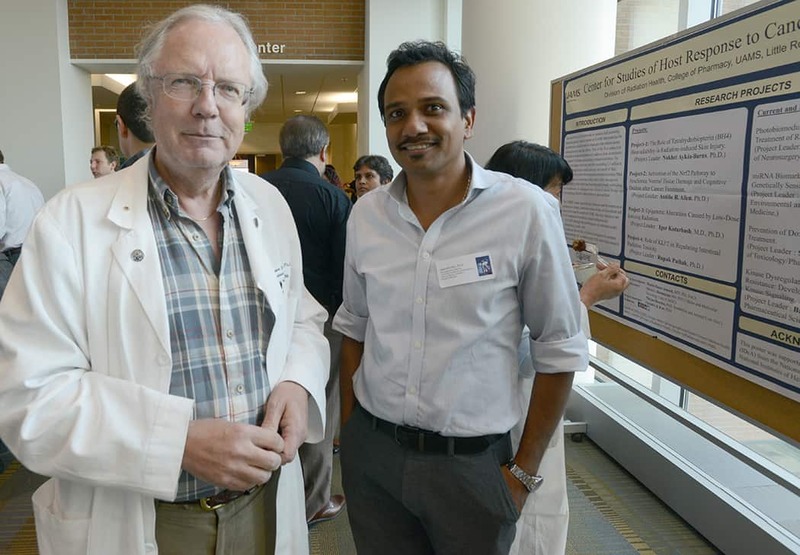 Organized by the office of Vice Chancellor for Research Lawrence Cornett, Ph.D., and supported by UAMS College of Medicine Dean Christopher T. Westfall, M.D., the showcase is an opportunity for faculty to share their work in a social setting. 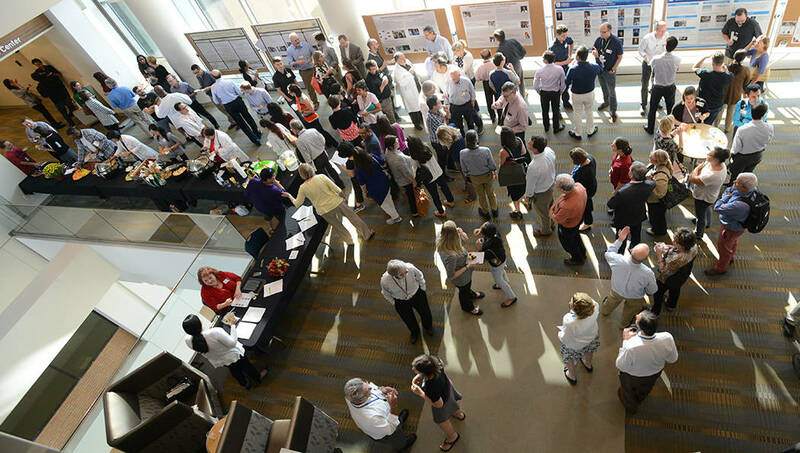 Attendees packed into the 10th floor of the Winthrop P. Rockefeller Cancer Institute for one of the most-well-attended showcases to date. They were met with posters and representatives for each COBRE and additional support programs. 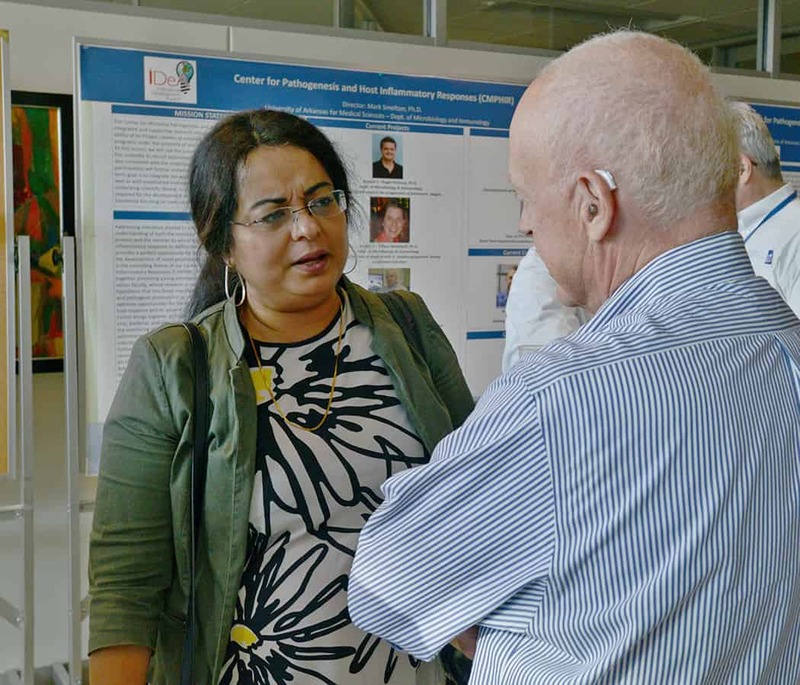 The COBRE programs focus on helping junior researchers establish their careers. Each COBRE is organized around a theme. The Center for Translational Neuroscience; Edgar Garcia-Rill, Ph.D.; $22.5 million; third and final phase. The Center for Microbial Pathogenesis and Host Inflammatory Responses; Mark Smeltzer, Ph.D.; $21 million; Phase II. The Center for Studies of Host Response to Cancer Therapy; Martin Hauer-Jensen, M.D., Ph.D.; $10.5 million; Phase I. The Center for Childhood Obesity Prevention; Judith Weber, Ph.D.; $9.4 million; Phase I. The Center for Translational Pediatric Research; Alan Tackett, Ph.D.; $11.5 million; Phase I. The Center for Musculoskeletal Disease Research; Charles A. O’Brien, Ph.D.; $11.3 million; Phase I. Over time, the goal is for institutions to develop pockets of expertise and researchers who have established independent funding. What’s more, the showcase highlighted efforts to provide resources of interest to all investigators. For example, Mary Aitken, M.D., M.P.H., and the Translational Research Institute are developing a Fundamentals in Research seminar beginning in December that will focus on issues like scientific career advancement, grant writing and management, and leadership skills building. For more information, contact Nia Indelicato at nlindelicato@uams.edu or visit the TRI website.